The Sorrows Of Keith Olbermann Commentator Brooke Gladstone -- host of NPR's On The Media -- finds fault with MSNBC's decision to suspend the host of its most popular show after he made political contributions to three Democrats. "We all know true objectivity is a myth," she says. Brooke Gladstone is host of On The Media from WNYC. OMIGOD! Keith Olbermann likes Democrats! MSNBC found out that he made campaign contributions to three Democrats this fall, and suspended him. 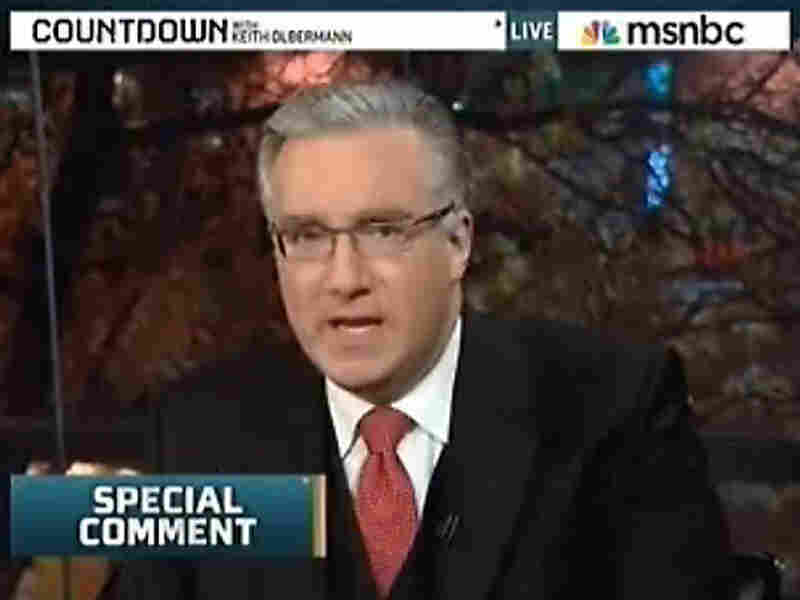 A screen grab shows Keith Olbermann on the set of his MSNBC show Countdown on Oct. 27, 2010. The host was suspended for making political donations to three Democrats. Sometimes even the most ethical, well-intended of journalistic policies is just stupid. Or assumes we are. After all, MSNBC's leading prime time host regularly anoints people "The Worst Person in the World." They tend not to be bleeding-heart liberals. In fact, they tend to work for Fox News. Fox News Host Sean Hannity has contributed to Republican campaigns. But Hannity still has his job. Coincidentally, this week Olbermann decided to drop the "Worst Person" feature, at least for now. It was his response to Jon Stewart's contention that MSNBC and Fox were equally unhealthy to the body politic. Olbermann rejected that equation, but conceded that "the tone needs to change." "The anger," said Olbermann, "was not an original part of it, nor was it an artifice that we added to it. It was a response to a threat to this democracy posed by Bush." All right! Tone changed. Politics? Not so much. Should Olbermann be barred from journalism's hallowed halls? Politics have inspired some of journalism's greatest heroes, muckraking investigators from Ida Tarbell and Lincoln Steffens to Barbara Ehrenreich and Jeremy Scahill. (Olbermann is no Ida Tarbell, but that's not because of his politics). He's right, though -- in journalism, tone is far more important than politics. Tone allows for civil discourse, for alternative points of view. In fact, if all journalists disclosed their opinions, then their antagonists would find less pleasure in the game of "gotcha" to which even the most honest and responsible news services are frequently subjected. No wonder ABC, The Associated Press, The New York Times, NPR and the other news organizations that barred their reporters from attending Stewart's "Rally to Restore Sanity" were such easy targets for ridicule. Most people already believe, rightly or wrongly, that they know just who those reporters are. What ultimately matters is the work they do. If showing up at the rally means they have an opinion -- and let's assume it does -- does that mean they can't be good reporters? We all know true objectivity is a myth. We use unconscious biases to filter billions of bits of sensory information every day, just to function. Reporters sorting through mountains of data must do the same thing. So is this impartiality obsession just about appearance? And do we need to keep up that appearance to retain the trust of the news consumers? The price of maintaining that appearance can be high. It can lead news outlets to refraining from calling a lie, a lie. It can lead them to give equal time to very unequal positions, distorting the truth in the process. As Stewart's partner in crime, Stephen Colbert, famously observed at the White House Correspondents dinner some years back, sometimes reality has a bias.